... before this whole health-nut craze. Keep in mind during your reading of this post that Peak Stupidity is no health-nut, diet-advise website. We have no interest in the health of our readers - we only want the eyeballs, as the successful leaders in this blog space would put it. However, your writer here is kind of interested these days in keeping his body functioning well (the blog must go on, after all), and diet can indeed be a big part of that. I've found the cutting down on some favorites fairly easy, yet others take a long time to ease out of,as I guess we may all have addictions of some sort. It wasn't always this way. It would be nice if my body would still be able to function perfectly well off of bread, cheddar cheese, Cadbury bars, and Guinness for a week as was my diet during a trip to Ireland. Are those the four basic food groups in the pyramid developed by the Irish version of the FDA? 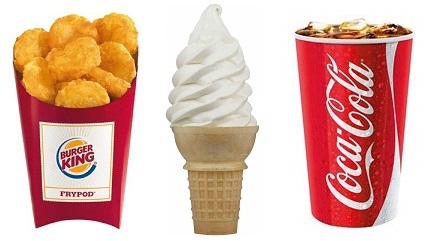 There was a time in which I enjoyed a Burger King breakfast of tater tots (OK, they call them "hash rounds", but they're nothing but glorified tater tots) with a vanilla soft-serve ice-cream cone. I'd dip the tater tots , OK, hash rounds [Don't! Sue! Us! We! Own! Nothing! - PS, legal department] into the ice cream. How much tastier can anything get?! And, you've got 3 of your 4 basic food groups covered, your sugar, your salt, and your fat. Top it off with a 64 ounce Coca~Cola to keep the diet well-rounded with the 4th of the very basics, the caffeine. Now, you've got a great foundation on that FDA pyramid. Actually, it was nothing but a damn triangle. I wondered what was behind that one of 4 faces on the FDA food pyramid (yeah, see, it wasn't supposed to be a food tetrahedron, so 4 faces). Possibly behind that one FDA-published face were gourmet jelly beans, beef jerky, cheer wine, and Pez. I can't do that anymore. Therefore it's a more rare treat to go get some old-fashioned all-American fatty, sugary, salty stuff at a drive-up joint. We'd been working hard that morning (on what limited the blog posts this week), so I deserved it. "Yeah, I'll get the fried chicken with fries and a chocolate shake." The guy I was working with knew I was in general trying to eat healthy, so I had a joke coming. The guy at the window taking my money was at least 25 years old, mind you, as I joked "hey, that stuff doesn't have any saturated fat in it, does it? I can't have any of that." "I don't know. I don't know what that is." Man, you can't even make a joke anymore if people are too ignorant to get it! What was I to do? "Here's the premise, see: There are different kinds of cholesterol in our bloodstreams ... fat can congeal under different conditions depending on the size of the molec... ". "Listen, I got other people in line, so ..."
Even David Letterman, with his many inside jokes, didn't have to put up with this crap. Should I have put it in the form of a tweet?